COLUMBUS, Ohio, March 7, 2012 — The first real-time image of two atoms vibrating in a molecule was recorded with a new ultrafast camera. A team from Ohio and Kansas state universities used ultrafast laser pulses to knock one electron out of its natural orbit in a molecule. The electron then fell back toward the molecule scattered off it. The use of the energy of a molecule’s own electron acted as a kind of “flashbulb” to illuminate the molecular motion. Standard imaging methods for a still object involve shooting it with an electron beam, which bombards the object with millions of electrons per second. The new single-electron quantum approach, however, enabled the researchers to image rapid molecular motion based on theoretical developments by scientists at Kansas State. The scientists used laser-induced electron diffraction (LIED) — a technique commonly used in surface science to study solid materials — to study the movement of atoms in a single molecule of nitrogen and oxygen. They chose the two common atmospheric gases because they already knew every detail of their structures. In each case, the researchers hit the molecule with laser light pulses of 50 fs, knocking a single electron out of the shell of the molecule and detecting the scattered signal of the electron as it recollided with the molecule. DiMauro and Ohio State postdoctoral researcher Cosmin Blaga likened the scattered electron signal to the diffraction pattern that light forms when it passes through slits. Given only the diffraction pattern, scientists can reconstruct the size and shape of the slits. 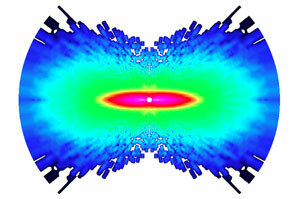 In this case, given the diffraction pattern of the electron, the physicists reconstructed the size and shape of the molecule — that is, the locations of the constituent atoms’ nuclei. The key of the experiment is that, during the brief span of time between when the electron is knocked out of the molecule and when it recollides, the atoms in the molecules have moved, Blaga said. The LIED method can capture this movement, “similar to making a movie of the quantum world,” he added. Besides its potential for controlling chemical reactions, the method provides a new tool to study a matter’s structure and dynamics, he said. Ultimately, the scientists want to be able to understand how chemical reactions occur. For the long-term, he said that applications in materials science and chemical manufacturing are plausible. The experiment was published in this week’s issue of Nature.